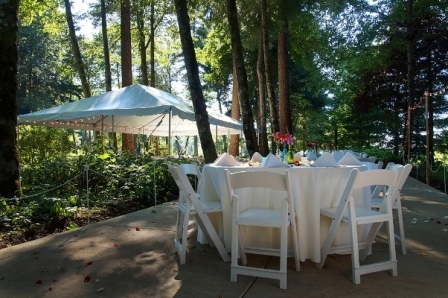 Located in the Columbia River Gorge, the Bridal Veil Lakes is one of the best outdoor wedding and reception sites in the Northwest. Towering trees shade the small lake surrounded by beautiful summer flowers. Your guests will be amazed by the breathtaking views of the Gorge. Bridal Veil Lakes is well equipped with tables and chairs for both the wedding ceremony and the reception, and requires only minimal additional event rentals for events up to 250 guests. 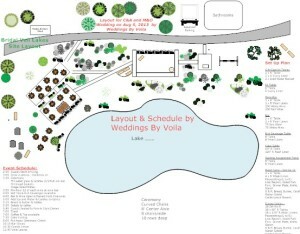 Voilà Catering is pleased to manage any additional rental tables, canopies, and chairs to accommodate up to 400 guests. One of our favorite venues, Bridal Veil Lakes also provides some unique challenges for catering truly great food. The long drive from any commercial kitchen completely eliminates the possibility of delivering hot food and catering a quality meal without special measures. Bridal Veil Lakes’ charcoal BBQ may be adequate for cooking a few items for small events fewer than 50, but the smoke and distraction of the BBQ in the middle of your wedding reception may not be what you desire. 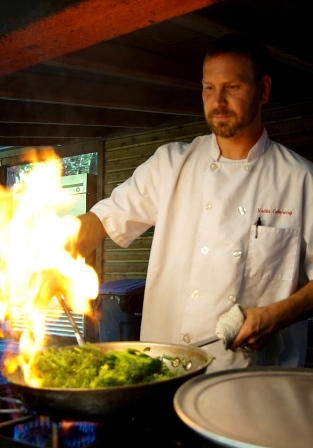 Voila Catering’s unique solution is to bring our chef team and our commercial convection ovens and sauté stations to the venue and cook everything at the venue, right before serving. It is the only method to provide a high quality, hot meal at this Bridal Veil Lakes for large events…any other option results in food that does not meet our quality standards. With our years of experience doing over 85 weddings at Bridal Veil Lakes, we are pleased to share our experiences of different event schedules, site layouts, and menu selections to make sure your wedding is smooth and flawless. Due to Bridal Veil Lakes’ large size and great variety of options, it is particularly important to hire a professional team that knows the venue well. Our experience makes the difference! Planning your wedding at Bridal Veil Lakes is more than just choosing the first song. Voila Catering will help design the entire event from arrival times and guest flow through the day to making sure that everything is cleaned up and your leftovers are taken home. An important part of preparing your event plan, is our CAD layout of the your event including the location of all the tables, the place settings, bars, gift tables, sign-in tables and ceremony layout. No detail is left to chance and everyone on our team is knows your wedding plan! We invite you to check our availability for your Bridal Veil Lakes wedding and schedule a consultation with us by calling us at 503-806-6658 or e-mail at events@voila-catering.com . We will discuss your wedding ideas, share our service options, tour our kitchen and rental warehouse, and often, provide a complimentary meal! Wonderful video from sister Meghan & Orang and sister Christin and Adam’s Bridal Veil Lakes wedding planned and catered by Voila Catering!